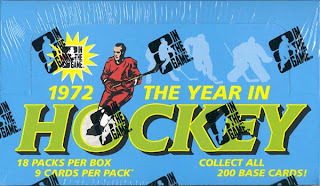 1972 The Year In Hockey is a pretty unique little set that came out this year from In the Game. There are all kinds of nice little subsets and special cards. With the odds of getting an auto about 1 in every 6 packs, there's a pretty good chance of landing a nice card. Unfortunately, that also means the price is pretty steep, at my local shop they're $6 a pack. I told the clerk I would like 3 packs, and when he informed me they're was only 5 left, he gave me a deal that I would get 5 packs for the price of 4. Deal! Odds are I should get a auto in the bunch, and hopefully some old-school Blackhawks for my collection. 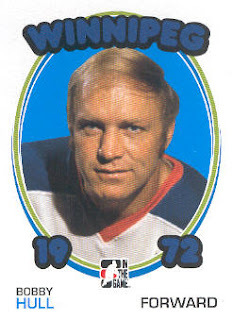 The very first card in the first pack I opened was The Golden Jet himself, Bobby Hull. I forgot that this set contains players and teams from the WHA, Bobby was a member of the Winnipeg Jets in 1972, the Blackhawks let the most famous player in franchise history walk to another league for a million dollars. Still a sore subject with my father. I couldn't believe it. 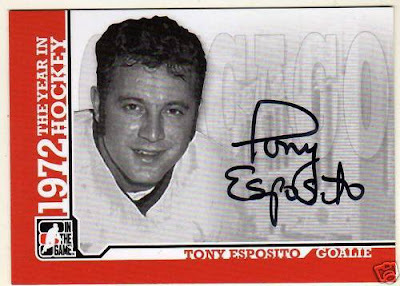 Not only did I score 2 autos in the same pack, but one was f'n Tony O! Needless to say, I'm very satisfied with my purchase today. great pack! I've got four autos from this set, one is a double! The Old Chicago Cougars! Before my time, but I do own a very ugly Cougar sweater that I wear on occasion. Very nice! I bought a Doug Jarett for my Blackhawks collection.